June 21—In the Pacific, Obama’s threatening patrols are flying and sailing close to Chinese territories, and are even deliberately violating Chinese sovereign territory at times. He is trying to build a web of Pacific alliances that will bring the United States to war with China in the Pacific. In Central and Eastern Europe, NATO is conducting provocative maneuvers on Russia’s borders, gunning for war, as German Foreign Minister Frank-Walter Steinmeier has correctly implied. And where was China’s President Xi Jinping from June 17 to 21? In a strategic master-stroke worthy of Gen. William Tecumseh Sherman, Xi Jinping was precisely in Central and Eastern Europe, NATO’s intended war front. Not on a mission of war, but a vital strategic mission subsuming the question of war,—one for a “win-win” policy of peaceful development, coordinated with Putin’s St. Petersburg International Economic Forum. Chinese President Xi Jinping (left) shakes hands with his Russian counterpart Vladimir Putin in Ufa, Russia, July 8, 2015. 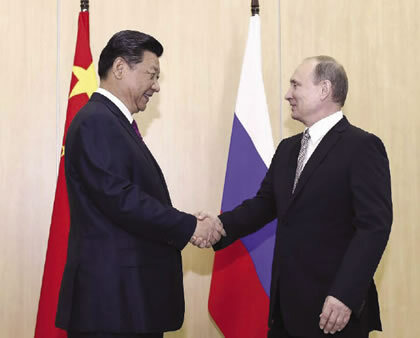 Xi said that China and Russia should continue to maintain their high-level strategic coordination within the Shanghai Cooperation Organization. China’s President has been visiting Serbia in Eastern Europe, Poland in Central Europe, and Uzbekistan in Central Asia. Xi visited the Czech Republic in April, while Central and Eastern European (CEE) leaders have visited China this year. This diplomatic and economic cooperation is part of the 16+1 process established between China and the 16 CEE nations in 2012. Most of these nations were once part of the Soviet Union or the Warsaw Pact, while many now are part of the EU or are applying to join. The 16+1 thus serves as a crucial bridge between East and West, and in particular serves as the hub for developments along the New Silk Road connection between China and Europe. Serbia has maintained strong relations with both Russia and China, even while it has been an applicant for membership in the European Union since 2007. Poland, on the other hand, under the current right-wing government, has fully joined Obama’s mobilization for military confrontation with Russia. Poland is calling for permanent NATO bases, while installing U.S. missile systems on its soil, missiles which are a direct threat to Russian security. At the same time, Poland has very close ties with China. Xi Jinping’s visit, expanding their strategic relationship and economic ties, is a clear demonstration of the win-win policy followed by both China and Russia, encouraging cooperation in mutual economic development with all nations,— which simultaneously deprives Obama’s puppets of their will to fight. It is exemplary that Xi is following his Central and Eastern Europe tour with a visit to Uzbekistan, where the Shanghai Cooperation Organization (SCO) is holding its 16th annual Summit in Tashkent, and where he will meet with Russian President Vladimir Putin, who will then travel on to Beijing for a state visit to China. Serbia is a major part of the New Silk Road, or the One Belt One Road (OBOR) as Beijing calls it,— referring to the overland New Silk Road Economic Belt and the 21st Century Maritime Silk Road by sea. China is already building major projects in and around Serbia, including the Belgrade-to-Budapest Railway, the Pupin Bridge over the Danube in Belgrade, and a roadway from Belgrade to Montenegro. This was the first visit of a Chinese President to Serbia in 32 years, but the two nations signed a strategic partnership agreement in 2009, which has now been upgraded to a “Comprehensive Strategic Partnership.” China has invested more than $1 billion in infrastructure and energy projects since then. None has been more important than the purchase in April of the 100-year-old Smedervo steel works by China’s Hesteel Group, for €46 million, saving the company and its 5,000 workers from a probable shutdown. On June 19, Xi visited the steel company with President Nikolic and Prime Minister Aleksandar Vucic. “Let Chinese-Serbian cooperation set a good example for cooperation with other nations of Central and Eastern Europe,” Xi said. 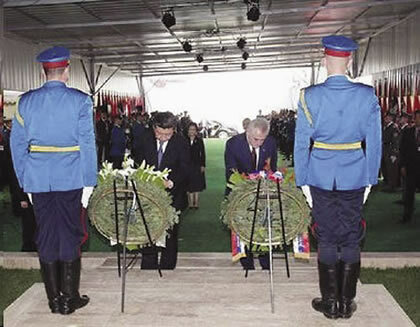 The most dramatic moment of the visit came when Presidents Xi and Nikolic laid a wreath of white chrysanthemums at the site of the former Chinese Embassy in Belgrade, which was bombed and destroyed on May 7, 1999, by a U.S. B-2 stealth bomber, killing three Chinese. Presidents Xi Jinping and Tomislav Nikolic of Serbia laying wreaths at the site of the former Chinese Embassy in Belgrade, destroyed by a U.S. bombing raid in 1999. The two Presidents later laid a cornerstone in the same location for the construction of a Chinese Cultural Center and unveiled a monument to Confucius. Xi’s wreath-laying did not indicate a desire for revenge—quite the opposite. Xi and President Nikolic laid a cornerstone at the site for the construction of a Chinese cultural center, and unveiled a monument to Confucius, as well as name plates for the newly named Confucius Street and the Square of Serbian-Chinese Friendship. There are already two Confucius institutes in Serbia, and Chinese is taught in over 100 middle and primary schools. To Xi, the Confucian concept of Harmony under Heaven applies to all people and all nations. As to Serbia’s efforts to join the EU, Xi said he supports the bid. China and Serbia also signed 21 agreements during the visit, in trade, infrastructure, and other fields. President Nikolic awarded President Xi Serbia’s highest honor, the Grand Collar of the Order of the Republic of Serbia. Russian President Putin had received the same honor when he visited Belgrade in October 2014. President Nikolic’s daughter-in-law, Dr. Milena Nikolic, appeared in the official picture of Presidents Nikolic and Xi. In October 2014, she had presented Serbia’s proposal for a canal between the Danube and the Aegean Sea—the Danube-Morava-Vardar/Axios-Aegean Waterway proposal—at a conference of Helga Zepp-LaRouche’s Schiller Institute in Germany. China has since financed a feasibility study on the project, but it has not yet been released. Serbia lies at a crucial point linking China’s Silk Road Economic Belt and the 21st Century Maritime Silk Road. The Belt and the Road meet at the Greek port of Piraeus near Athens. In April, the China Ocean Shipping Company (COSCO) purchased a majority share of the port of Piraeus as the primary terminus of the 21st Century Maritime Silk Road, for Chinese goods shipped to Europe. Goods going to Central and Eastern Europe will travel from Piraeus by rail—mostly built by China—through Macedonia, Serbia, Hungary, and on. 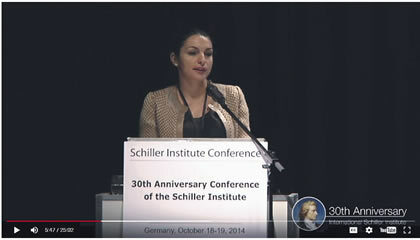 Assistant Prof. Milena Nikolic, daughter-in-law of President Nikolic, presented a proposal by herself and Dragan Duncic, for a Danube-to-Aegean Sea canal at the 30th Anniversary Schiller Institute Conference in 2014 in Germany. President Xi traveled on to Poland on Sunday, June 19. In an article published in the leading Polish newspaper, Rzeczpospolita, on June 17, Xi referred to Copernicus, Madame Curie, and Chopin as Poles who have made great contributions to mankind’s progress, and who are well known and respected in China. He also noted the Polish Jesuit priest and scientist Michal Boym, who worked virtually alone to defend the last Ming Emperor in the 1640s against the Manchurian Qing invasion, and also published works on Asian flora and fauna. Xi praised Poland’s historic collaboration with China, as one of the first nations to recognize the People’s Republic of China and the first Central European country to join the Asian Infrastructure Investment Bank (AIIB, initiated by China). China and Poland are each other’s leading trading partners in their respective regions, with two-way trade of more than $17 billion in 2015. There are five Confucius institutes in Poland, and Xi said that a growing number of Chinese universities are teaching the Polish language. He pointed out that Poland lies on both the Ancient Silk Road and the equally ancient Amber Road—so named when amber was the “gold of the north”—the north-south trade route from the Baltic region through Poland to Venice, and then on by ship. He noted that several Chinese rail routes to Europe either terminate in, or pass through Poland. Xi indicated that Poland is pursuing reindustrialization, while China is seeking international cooperation in distributing “production capacity,” a reference to his policy of using China’s so-called excess capacity (in the context of the western economic collapse) to build industrial production facilities abroad. Xi and President Andrzej Duda signed perhaps 40 deals and MOUs on June 20, mostly in construction, raw materials, energy, finance, and science. Duda said he hoped that Poland would be China’s “gateway to Europe,” pointing both to Gdansk Port and the land ports for the rail connections. 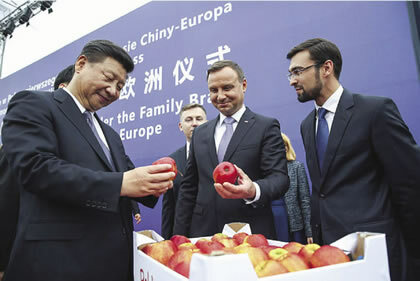 During President Xi Jinping's trip, he and Polish President Andrzej Duda admiire Polish apples, which can now be exported to China via the New Silk Road trains connecting China and Europe. Xi and Duda agreed to upgrade their relationship to a “comprehensive strategic partnership” from the existing strategic partnership, as Xi and Nikolic have also done for China and Serbia. At the time of this writing on June 21, Xi has moved on to Uzbekistan in Central Asia for a state visit, at the invitation of President Islam Karimov, before attending the SCO Summit in Tashkent on June 23-24. In addition to meetings with government leaders, Xi will address Uzbekistan’s Senate and the Legislative Chamber, the two houses of the Oliy Majlis. The SCO Summit will officially accept both India and Pakistan as new SCO members, which now includes Russia, China, and four of the five Central Asian nations—Uzbekistan, Tajikistan, Kyrgyzstan, and Kazakstan. The addition of the two South Asia nations will mean that 60% of Eurasia will be collaborating through the SCO in both strategic and economic matters. There are concerns that the tensions and occasional hostilities between India and Pakistan may undermine the level of mutual political trust within the SCO, but both nations are anxious to join. The broader cooperation within the SCO could in fact contribute to resolving some points of contention between India and Pakistan. Iran, which is now an observer at the SCO, is expected to be accepted as a member in the near future. Cooperation between the SCO and the Eurasian Economic Union (EAEU), comprising Russia, Belarus, Kazakhstan, Armenia and Kyrgyzstan, provides a further basis for President Putin’s call at the recent St. Petersburg International Economic Forum for a “Greater Eurasia,” comprising potentially all of the Eurasian nations, including, Putin emphasized, the nations of the European Union. This is the vision of the future, based on mutual development, both physical and cultural, which must be accomplished if the onrushing geopolitical warfare is to be prevented. Schiller Institute 30th Anniversary, Frankfurt, Germany: The New Silk Road and China's Lunar Program: Mankind Is the Only Creative Species!